These are simply the best vegan flourless, oilless, sugarless cookie, on earth! These heavenly vegan cookies are so good, they're dangerous. They taste just as good, if not better, than those made with flour and sugar, but they're chock-full of nutrition. They're so good, you might eat the whole batch right out of the oven. You have been warned! You'll be cooking that at @ 350°F / 175°C for 25-30 minutes. Step 1 - Prepare your toasted pecans. One of the parts of this recipe that makes it so good is the play of chocolate against pecans. To make that work well, you can't just buy toasted pecans and hope they'll work, and you can't use raw pecans. You have to toast your pecans to bring out their OooMPH. I keep raw pecans ordered from online in the freezer, because nuts can go bad if left out for too long, and the last thing you want to ruin your perfect cookies are rancid oils. To toast some, I just take out a handful and spread them on a toaster oven tray. I set the timer for about 4-5 minutes. The thing about pecans is that they burn easily. You want them to go long enough that you can start to smell them and they hiss and crackle, but you don't want them to burn, and that's a fine line. But, it's a delicious fine line, and if you know how to find it, it'll give any dish you add it to just that much more POP. So, step one is to preheat your oven to 350°F / 175°C and toast a handful of pecans, however you want to do that. 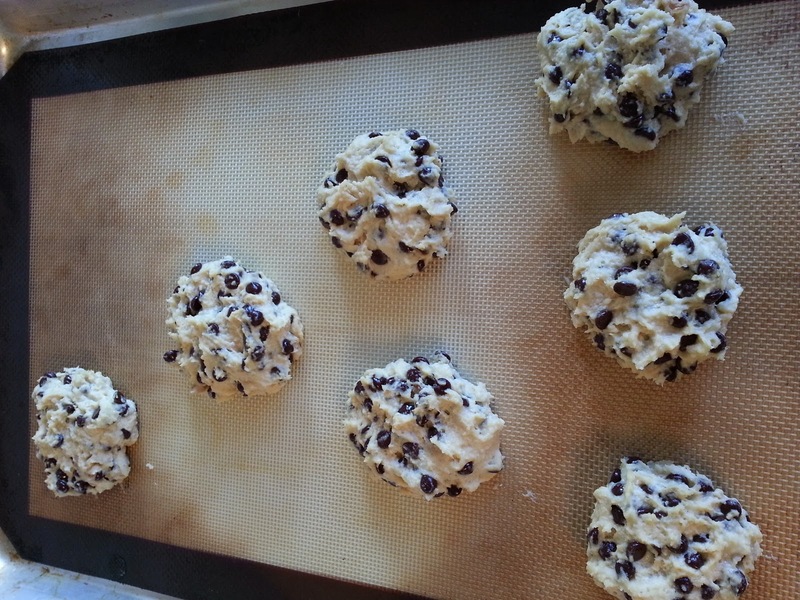 Set them aside to cool a bit while you make the dough/batter. Place one cup of raw cashews in a food processor. Again, I freeze my nuts, so when I make these, the nuts are frozen. I don't think it will matter if they're room temperature, as long as they're not roasted. You want raw cashews to get the creaminess that makes this work. To that cup of cashews, add 1/4 tsp of baking powder and 1/2 tsp of vanilla. We make our vanilla at home, but there's no reason extract, powdered, or ground vanilla wouldn't work as well. 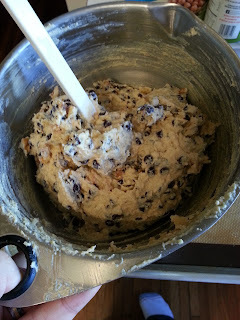 Now that your "dough" is nice and blended, dump it into a large bowl, chop your pecans and open up your bag of mini morsels. I prefer a lot of chocolate. If you're using larger chocolate chips or you want more nut than chocolate flavor, decrease the amount of chocolate chips and increase the amount of nuts. 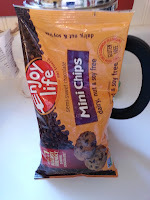 The cookie pictured, and my preference, is 1/2 cup to 3/4 cup of chopped pecans, and the whole 10oz bag of morsels. Just dump them into the batter, stir it up, and you're done. But wait - at this point you're going to want to lick the spoon, try some raw batter, or sneak a taste. I don't recommend it. It will taste absolutely nothing like the final cookie. It will be very much flavored like chickpeas. Step 4 - Bake them! Whatever shape you make these will be the shape of your final cookie. 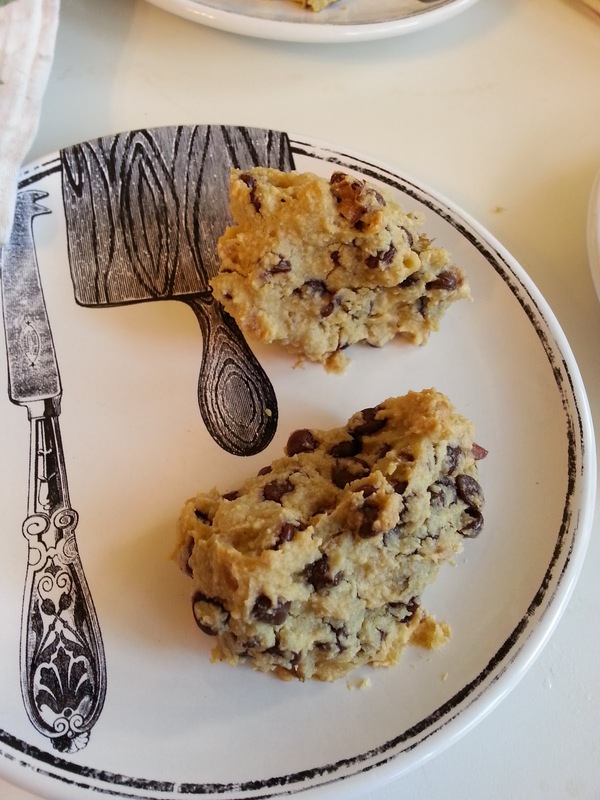 They do not settle like normal chocolate chip cookies do, because they aren't full of oil and sugar. You could, if you really wanted to, add in some sugar or oil to get that effect, but it's sooo not necessary. These come out perfectly fluffy when they're done, and they're pretty resistant to over-baking, unlike sugar/oil based cookies. You might also be wondering about salt... there's no salt in my recipe, though you could add some if you want. I don't use it because my can of chickpeas has three ingredients: chickpeas, water, and SALT. They're plenty salty as it is. If you're using homemade chickpeas or find some that don't have any salt, then go ahead and add 1/4 tsp to 1/2 tsp depending on how salty you like your cookies. 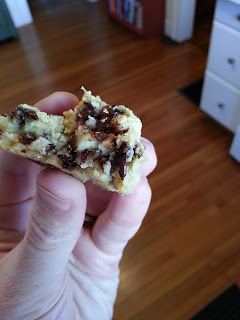 I want to make these but with cacao nibs instead of the chocolate chips. Can I do that and add something else for the sweetness, like dates or maple syrup? And if yes, how much should I add? I've never tried, but depending on how much sweetness you're after, I would think a tablespoon or two of maple syrup and/or chopped dates would be fine! If you do add the syrup, decrease your aquafaba liquid by the same mount or your cookie might end up too wet. Can you sub almonds for the cashew? Do you think soaked almonds would be creamy enough? I used 2/3c. almond butter, which is the measurement equivalent of 1c. almonds. Then added 1/4c. coconut flour for a thicker texture. It worked fine. I suppose that one could use a bit less than the entire amount of aquafaba liquid if omitting the coconut flour. There did seem to be a slight difference in taste between almonds and cashews.